From Medicom. The Justice League gets a MAFEX figure from Medicom! Based on the forthcoming Justice League film, these 6' tall figures of Batman, Superman, and The Flash are exquisitely detailed and fully articulated. 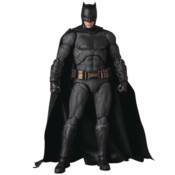 Batman comes with a fabricized cape, two guns, three batarangs, interchangeable hands and two facial expressions. Superman features a fabric cape, interchangeable hands, and two interchangeable faces, while The Flash comes with two interchangeable heads (masked and unmasked). Each figure also comes with a figure stand.